• Benefit from our experience. First of all, we believe in and use all of the products we sell. If it didn't meet our (and our dogs') standards, it wouldn't be available at The Dog Outdoors. We can personally answer any questions you have because we use the products. We are happy to always be available for questions even long after you have made a purchase. We know how important our customers are to us. • No where else on the web will you find more information (including videos) about the products we sell. We make every effort to bring the experience of shopping in an actual store to your computer screen and even go beyond that. See our products in use in high definition video, read our buyers guide to help make your decision and if you still have questions contact us 24/7. • We pride ourselves on being a small business. This allows us to put our own personal touch into your buying experience and give you unparalleled customer service. With few exceptions your order will be packed up and shipped out the very same day by my wife or myself. You will get your stuff faster than most any place you shop at online. Let us show you what customer service is all about! • You are dealing with real people. • We understand the importance of giving back. Help us support great organizations like Canine Companions For Independence. • Your satisfaction is guaranteed. If you are not satisfied with your experience, let us know about it. We will make every reasonable effort to make it right. We want you to be happy! We didn�t start The Dog Outdoors with the intention of it becoming a full time job. But, as it turns out, life had other plans. Back in 2007, we were both working at a tech company in Austin,TX and our only "babies" were our two pups (miniature schnauzer) Brinkley and (lab/pointer mix) Parker. Parker was chewing up everything in the house. Daily hour-long walks were not enough for him. He needed to RUN. 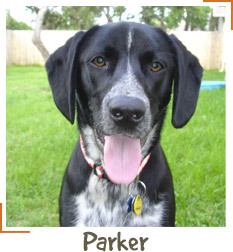 We were desperate to find a way to exercise Parker when Scott found the Italian designed WalkyDog® bicycle dog leash. It was love at first ride. Being able to bike Parker, was way easier and more effective than anything else out there. No more chewing on Jenny�s shoes, DVDs and furniture. The WalkyDog truly changed our lives and, after talking it up to several people at the dog park, we decided to start The Dog Outdoors. Since starting out in late 2007 with one product, we have grown to include all sorts of gear for active dogs and their owners. We only sell products that have the stamp of approval from our own dogs. Our goal is to provide the best products and more information than anywhere else about those products. In 2008 we brought a beautiful baby girl into the world. 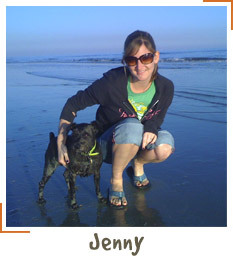 The success or The Dog Outdoors allowed Jenny to be a full-time mom and run the business while Scott still worked full-time at his day job. 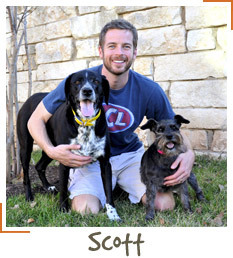 In early 2010 (on Scott�s 30th birthday) we decided to make The Dog Outdoors a full-time gig. It was quite comical, really. Our house was completely invaded by inventory boxes and toddler toys. Scott braved an entire summer of triple digit heat while packing up orders in our garage. So, in January of 2011, we found an office space and got our house back. And wouldn't you know? We quickly refilled the house with baby things in preparation for our second baby girl who came that fall. 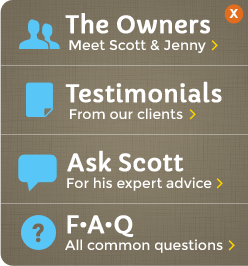 In 2012 we hired our first employee (Scott�s long-time friend, Matt) who has made our lives a lot more sane. 2013 brought more change-possibly the biggest for our business-as The Dog Outdoors took on a brand new look with our site redesign. As of this writing in the Summer of 2015, we are blessed to have yet another baby girl. Scott and Parker are a little overwhelmed by all the pink :)...And through this entire journey, Brinkley and Parker have enjoyed testing leashes, collars, toys, treats, beds and much, much more (lucky dogs). Scott Daughtry - Born and raised in Galveston, TX, I am what they call a "BOI" (Born On the Island). I�m the oldest of four kids and family has been, and will always be, a big part of my life. Growing up, we had a number of dogs, but I was hesitant of all that responsibility when Jenny started begging me for one while in college. I finally caved a year after we graduated. The love was instant and the dogs immediately became our "kids". I come from a long line of entrepreneurs and I�ve always felt that being a business owner is my calling. I can never go back to a 9-5 desk job. Outside of my beautiful wife and kids, The Dog Outdoors and our pups are my biggest passion. I�ve always enjoyed being on, in or near the water. Whether its fishing, surfing or wake boarding, you�ll find a smile on my face. I am a pure bred miniature schnauzer. Mom and Dad picked me up in May 2007 from Victoria,TX and I�ve been loved and pampered ever since. Mom and Dad thought I would like another four legged friend, so 5 months later,that other dog (Parker) showed up. Frankly, I�ve grown quite fond of Parker, but I sure miss all the attention I used to get. I absolutely love hunting bugs, hoarding (but not actually chewing) bones, sleeping on top of the fluffiest thing I can find, and barking. Barking is what I do most. Snuggling with Daddy is my favorite thing in the whole.wide.world. **Update - Matt is no longer working with us and has moved on to bigger things, but we will always be grateful for his help and friendship over the years. Hi there. 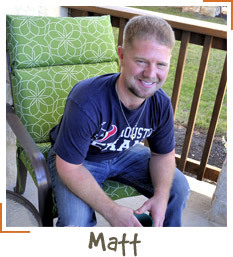 My name is Matt and I was raised on a small island in South Texas. Think of Gilligan's Island, add more tourists, and you get the idea. I met Scott back in first grade and we've been buds ever since. I've known Jenny for thirteen plus years. Both my bosses are pretty awesome plus they don't mind if I wear shorts and flip flops to work. Rhodesian Ridgebacks have been in my family ever since I can remember so I have a soft spot for that breed. I currently have a cat but plan on getting a Ridgeback when I have more space. A few hobbies of mine are working out and playing video games (when I have the time). Also, I've sort of mastered the art of lounging by the pool when the weather is nice and I have the day off. I am a sixth generation Texan and have lived in Austin since I was 5 years old. I�ve always had dogs (specifically, English Springer Spaniels) and knew that dogs would always play a part in my life, I just didn't realize how big! Scott and I met my freshman year in college at Texas State University, married 6 years later, and started our (human) family 2 years after that. I can often be found at the park with my girls, working with my awesome hubby, on the trail with our dogs, having a beer with my girlfriends and probably playing a video game of some sort (I literally had a "Dr. Mario" world record score while pregnant with my first daughter, but never officially submitted it b/c I went into labor). I love crafting - no, I LOVE crafting - and am thrilled I found a way to inject some creativity into the business with my personalized dog bowls. I was a lonely lab-pointer mix puppy in a big, cold, animal shelter. My only friend was a hard, plastic squirrel toy. I�ve always had a special attraction to squirrels. Someday, I will catch one. 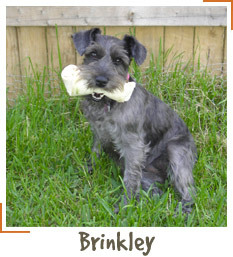 In October 2007, Mom, Dad & Brinkley came to bring me to my real home. I was so happy that I chewed up everything that seemed important to mom and dad. They really seemed to like that because when they came home and found what I�d done, they�d whoop and holler! One day, dad came home with a new toy that hooked up to his bike and that�s when our special rides together began. I just didn�t have the energy to chew on their things anymore, but they seemed okay with that. Ever since, I�ve become a super special dog. I get to try out all kinds of toys and gadgets. And mom and dad say I look GREAT on camera.